Consistent reliability. Toner combines quality with value. Manufactured to exacting specifications. Device Types: Multifunction Laser Printer; Color(s): Black; Page-Yield: 18000; Supply Type: Toner. Genuine OEM quality. Reliable and dependable. Simple to install. Device Types: Multifunction Laser Printer; Color(s): Black; Page-Yield: 24000; Supply Type: Toner. Prints crisply and cleanly from the first page to the last. Device Types: Multifunction Laser Printer; Color(s): Black; Page-Yield: 40000; Supply Type: Toner. Prints solid blacks and clean edges. Cartridge uses toner efficiently. Consistent printing. 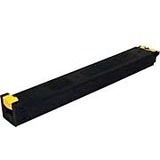 Device Types: Copier; Color(s): Black; Page-Yield: 25000; Supply Type: Toner. High-quality printouts. Reliable and dependable. Installs quickly and easily. Device Types: Copier; Color(s): Black; Page-Yield: 40000; Supply Type: Toner. Genuine OEM quality. Installs quickly and easily. Dependable and built to last, so you can print without worries. Device Types: Copier; Color(s): Black; Page-Yield: 10000; Supply Type: Toner.